The DataONE metrics service provides information about the use of content across the entire DataONE federation and makes those metrics available at various levels of detail. A high level overview of the infrastructure is provided in Figure 1. Figure 1. High level implementation of the DataONE Metrics Service. Events such as READ activity are logged by Member (MN) and Coordinating (CN) Nodes and aggregated by the log aggregation service on the CNs. Further processing is performed done based on the COUNTER Code of Practice at the Log Processor. The Metrics Reporting service generates reports for the DataCite SUSHI API and sends them to the DataCite HUB. 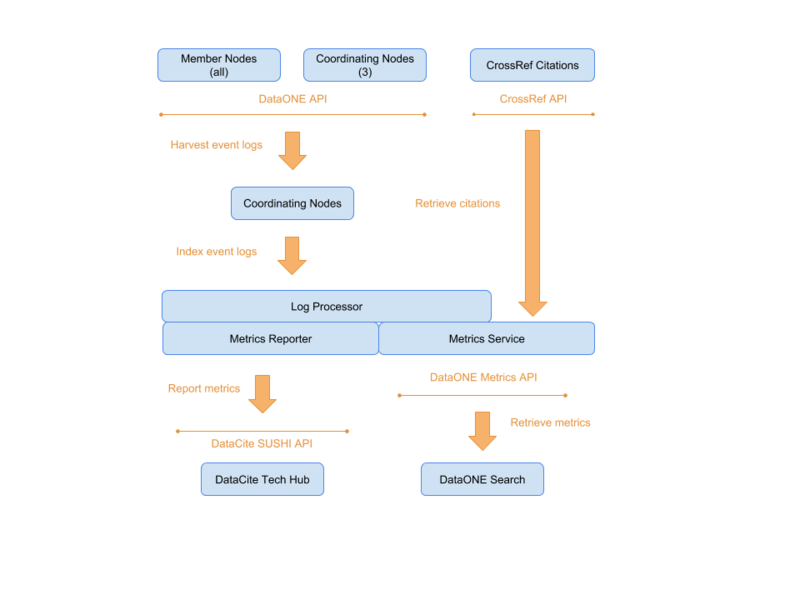 The DataONE Metrics API uses these processed logs to drive metrics display on the DataONE search interface. © Copyright 2018, DataONE Revision 5f11c14e.